The most important thing when diabetes meets you is to lose weight and maintain a balanced diet. That’s all there is too it you may have to train your pallet to enjoy blander foods. You absolutely have to enforce low sugar, low salt and very low processed foods, especially white overly processed flour. Processed foods are any product that comes in a package beginning with ingredients like enriched flour, sugar etc. A food you’ll need to add water too before eating. Not only is this a "Glycemic Index pleaser"but Salmon is high in Omegas which fights diabetes! These foods also help the diabetic lose weight! There's no reason to starve to lose weight after being diagnosed with diabetes. Meals like this are not only healthy but they are every bit as appetizing as a Big Mac! Insulin is a hormone, it assists in feeding our cells without it the cell starves. All cells in our body need nutrients that's why we eat. Two chemicals in the body that raise and lower blood sugar levels. 1. Insulin lowers blood sugar (glucose) from the blood and directs it to receptors on the cell membrane. 2. Glucagon (glue-ca-gone) raises the blood sugar level in the blood. It does this during times of famine or in between meals. After we eat we have quite a bit of glucose ready for shipment via the blood to the cell. This stimulates the pancreas to release insulin for the sole purpose of getting the glucose out of the blood stream and into cells. The pancreas is the origin of both "insulin and glucagon." When the body has food to digest and process insulin is secreted. But when the body is hungry in between meals glucagon is releases from the pancreas. Subsequently, glucose is injected into the blood stream when blood sugar levels are low. Glucose is once again available for the bodies needs. Insulin is manufactured in the pancreas where eating stimulates it secretion into the blood stream after food has been eaten and begins to digest. Now it’s time for the cells to begin uptake of blood sugar (glucose) principally from the liver, muscle and fat cells, where it’s stored. Muscles use stored glycogen for energy to move the muscles. In a diabetic the pancreas produces insulin but the liver and muscles won’t respond in their normal sequence. ...during the non-eating times the body needs to utilize hoarded glucose. As a person grows in body weight the opposite is happening in their liver and muscle cell. The receptors on the outer membrane of the cells are disappearing. Which is limiting insulin’s ability to bind with the cell receptors for transport of glucose into the cell. Without insulin providing energy to the cells, the liver convert stored energy glycogen, or glycerol the body’s fat into glucose. This can cause rapid weight loss in undiagnosed diabetics. 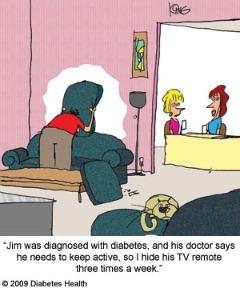 About 90 percent of all people diagnosed with diabetes have type 2 diabetes. Type 2 affects adults for the most part. However, the growing number of obese children is tipping the scale. The disease is found more frequently in children and adolescents due to the eating habits today. 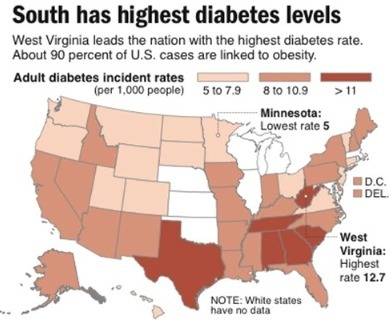 The ethnic groups such as: Native American, Black people, and Hispanic are showing the greatest rise in diabetes, due in part to high carbohydrate and sugar consumption.